You can never have enough storage and if you primarily use a notebook you more than likely know that storage space is a precious commodity. Most pre-configured notebooks that are available at brick and mortar stores come with 250GB or 320GB hard drives is seems. That may sound like a bunch of space when you are standing in the store, but after you put all your programs, games and digital media on the drive it usually doesn’t leave you with much space for future growth. If you have reached or are nearing full capacity on your storage drive then you might want to consider upgrading to a larger 750GB or 1TB 2.5″ notebook hard drive. If you are after performance then you’ll want to stick to a 750GB drive as they are available at 7200 RPM and offer the fastest data transfers possible on a notebook hard drive. If you don’t really care about performance and just want as much storage space as you can get in a 2.5″ notebook drive then a 1TB 5200 RPM hard drive is the ideal choice for you. Today, we’ll be looking at a the WD Scorpio Black WD7500BPKT 750GB 7200 RPM 2.5″ SATA notebook hard drive. With a 7200 RPM drive speed, 16MB cache, and 3 GB/s SATA interface speed, the 750GB Western Digital Scorpio Black hard drive is the largest 7200 RPM drive that Western Digital offers right now. When it comes to pricing, the WD Scorpio Black 750GB Hard Drive retails online for $104.98 shipped, which makes it $0.14 per Gigabyte. For comparison sake the Western Digital Scorpio Blue 5400 RPM 750GB notebook hard drive can be purchased online for just $89.99 shipped, which comes out being $0.12 per Gigabyte. If you are looking for more performance then the cost for that speed is only a couple pennies per Gigabyte, which isn’t going to break the bank for most people. 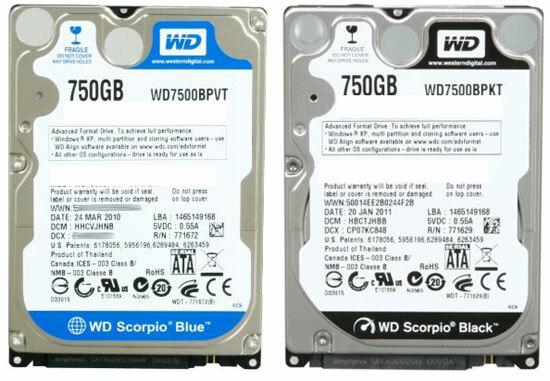 The WD Scorpio Black 750GB is sold under the part number WD7500BPKT, and is obviously part of the Black series. WD has color coded their products, which makes is easy to see who they are aimed at. Their mainstream products are called “Blue,” power-efficient drives are named “Green,” and high-performance drives are called “Black.” All of the WD Black drives spin at 7,200 RPM, utilize a SATA/300 interface with Native Command Queuing (NCQ) support, and have 16 MB of cache memory. Those not needing performance like this should look at the Scorpio Blue series as they feature 5,400 RPM drive speeds (5,200 RPM on some), 8 MB of cache memory and a slightly lower prices. The WD Scorpio Black 750GB uses three 250GB platters to reach the full capacity rating of the drive, which is impressive for a drive of this size. What is also impressive is the 12.0 ms average seek time! 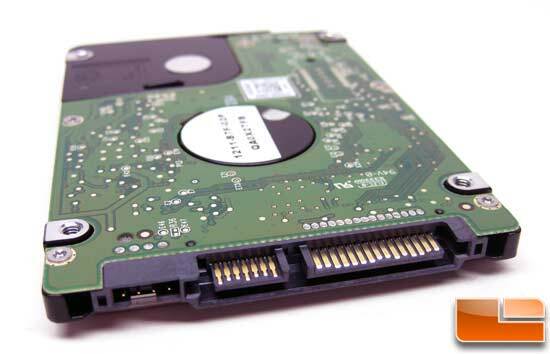 The back of this 2.5″ notebook hard drive is pictured above and gives a better look at the SATA power connector and the SATA NCQ interface. The WD Scorpio Black is the first WD notebook drive that we have tested that uses ‘Advanced Format’ technology. For years now most hard drives have written data blocks in traditional 512 byte sectors. Over the past three years the industry have been moving to a larger sector size of 4 kilobytes (4,096B) for obvious reasons. The Advanced Format (AF) nomenclature that WD is using is just their way to ID what drivers are using 4KB sectors. If you purchase this hard drive and install a brand new operating system on it from scratch then you won’t even notice the changes, but if you are cloning an older storage drive to the WD Scorpio Black 750GB drive that we have here or any WD Advanced Format drive you will have to run the WD Advanced Format Hard Drive Download Utility as you need to properly align the drive after the cloning is done. Benchmark Results: The Western Digital Scorpio Black 750GB had average read speed was found to be 100.7MB/s with an average write speed of 98.4MB/s with the latest version of HD Tune Pro. The Hitachi 5K500 320GB drive scored 55.7MB/s in the read test and 55.1MB/s in the write test. The WD Scorpio Black was also the same temperature or cooler, which is a shock as it is a 7200RPM drive with more than twice the capacity. Western Digital Scorpio Black is highly recommended if you are buying a hard disk for your laptop.It is also recommended that you buy external hard disk manufactured by Western Digital because of its high performance.